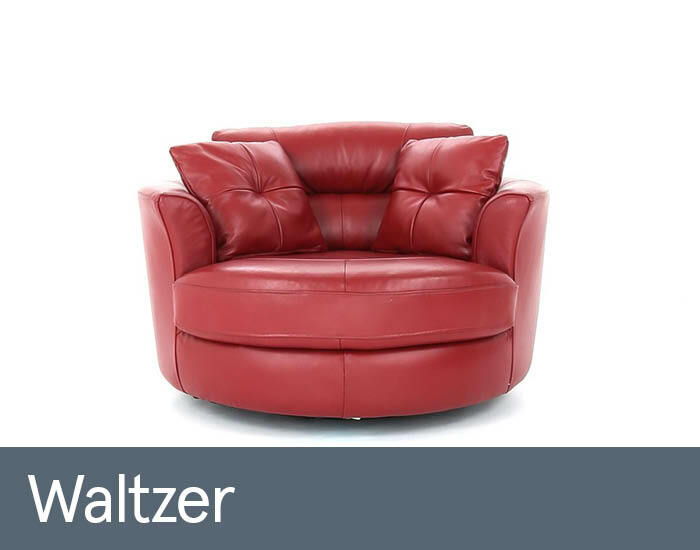 Waltzer offers a wonderfully contemporary styled swivel chair with an attractive circular design, perfect to make a design statement in any living space. Perfect as a one-off to compliment existing furniture and decor, or a charming addition to an office/study room. Upholstered in quality, top-grain leathers with an extensive range of colours help to give the swivel chair a sleek, clean finish and perfect to personalise to your ideal colour. With its simplistic design and simple detailing makes the swivel chair versatile to most surroundings. Crafted with a reinforced hardwood frame and fully sprung seat platform for a durable chair, it is held by a stable, painted steel base and mechanism for smooth 360 swivel function. The plump fibre filled back design with integral lumbar support, aided by the pocket sprung foam seat for the perfect blend of comfort and support. Complimentary scatter cushions in matching colours are a perfect finish to the Waltzer swivel chair.